For more than a century paleontologists have been puzzling about the function of the sabertooths’ namesake upper canines, with new studies and analyses being published every year, and a sort of consensus is emerging about the way these extinct predators would use their impressive weaponry, as discussed elsewhere in this blog. But a few decades ago it was fashionable to say that such enormous canines could not be used for killing prey and were there only for display. According to that view, sabertooths would intimidate other predators with their showy fangs at kill sites and gain access to carrion, (their primary food source, according to such theories) as well as using them to resolve disputes with rival males for the access to females. There are many reasons why this theory is wrong, as I discuss at lenght in my book, “Sabertooth”. But the important thing I would like to stress now is that, although the primary function of the “sabers” was related to hunting, it doesn´t mean they weren´t used in display. For instance, let us look at Megantereon. When the animal was relaxed, the tips of the upper canines would protrude beyond the upper lips, an impressive but not neccesarily scary sight. But when several muscles of the face contracted, pulling back the lips and moving up the nerve pads of the whiskers, the resulting display of teeth would give pause to any rival. However, the facial language of the sabertooths, like that of any cat, would be more complex and subtle than just an option between baring the teeth or not. Felids share with us primates the privilege of having more facial muscles than any other mammal, and they can convey a wide range of emotions to a conspecific with their facial expressions. Baring the teeth more or less fully, opening or closing the eyes (and pupiles), turning the ears one way or the other, all these elements combine to send totally different messages. For instance, in the illustration shown here Megantereon is not really trying to intimidate anyone; instead, it has just caught the smell of another cat in the plants around it, and is performing the “Flehmen”, a non-aggressive gesture that is produced as the animal tries to smell particles in the air with the Jacobson’s organ, located in its palate. Facial expression is completed with motion. It can be sometimes difficult to read the difference between a Flehmen gesture and an aggresive snarl in a still photograph, but in the live animal there would be no possible confussion. When doing “flehmen”, the cat moves its head slowly to the sides as it tries to capture the scents in the air, but I don’t need to remind any cat owner of what kind of motions and gestures accompany the baring of the teeth in an irritated feline! But let us not deceive ourselves, even when the teeth are used “for show” in aggresive displays, the animal must be ready to turn threats into real aggression. And that was a definitive weakness of the “display only” theory of sabertooth canine function. If paleontologists rule out the use of the sabers in hunting because of their supposed fragility, then it makes little sense to hypothesize that they were used to scare rivals away, because no display of strength can be used indefinitely without an occasional demonstration. And biting your rivals during a fight is no less dangerous for fragile teeth than it is to bite your prey. In fact, during a dirty fight with a rival cat there is even less control and more chance for breakage. Sabers were there for show, most certainly. But not merely! In our imagination, we often picture the sabertooths engaged in savage predatory battles, but when we encounter the big cats in the wild most of the times they are just resting, or walking casually from point A to point B. I like to imagine what it would be to travel back in time to the Pleistocene and, after a long search, to come across a sabertooth cat, like this Megantereon, walking relaxedly and disappearing in the bushes after a short while… we wouldn’t need to get scared by its ferocity, just to absorb its beauty. This is one of the reasons why I think we can never pay too much attention to anatomy and proportions when reconstructing these creatures. Only in that way can we reach a bit closer to that impossible goal -to see the real animals face to face. 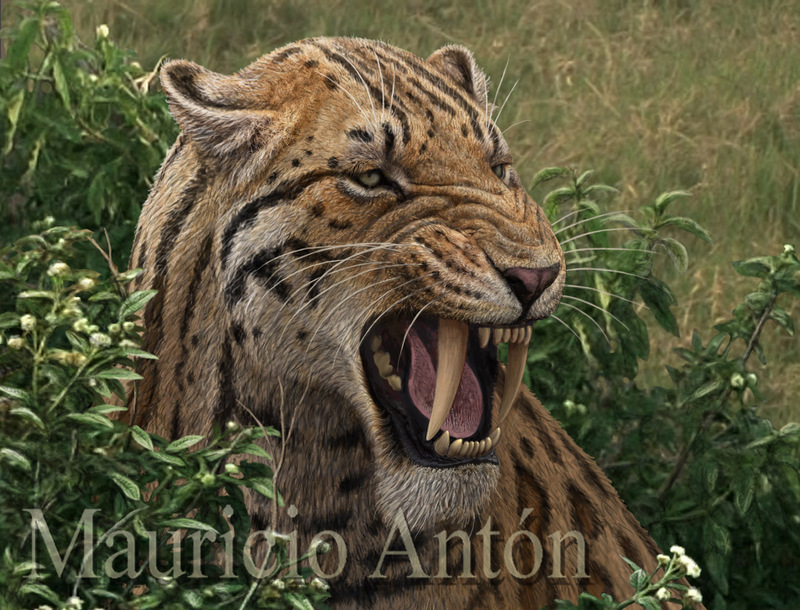 The fossil sites of Batallones provide amazing insights into the predator guild of the Vallesian epoch (Late Miocene, 9,5 Ma) of Spain, and are best known for the incredible collection of fossils of sabre-toothed felids, including the leopard-sized Promegantereon and the lion-sized Machairodus. A less known fact is that the other “half” of the felid family, the felines (or “conical-toothed cats”) were already present and represented by a respectable sample of fossils at the site. Those early relatives of our modern lions and tigers posed no threat for the sabertooths, because they were all much smaller animals. Two species are known from the site, the lynx-sized Pristifelis attica and the wildcat-sized Leptofelis vallesiensis. 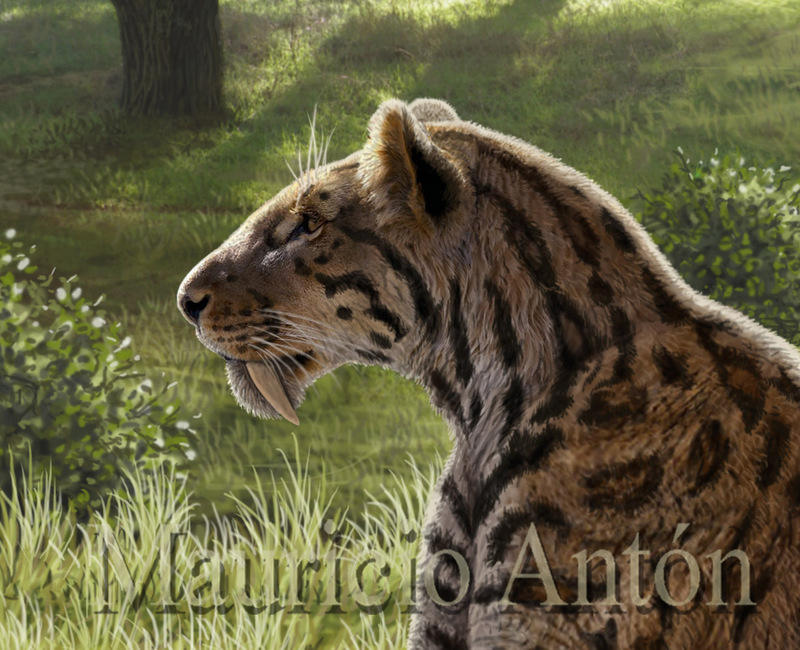 Years ago, in our initial description of the animal we called it Styriofelis vallesiensis because its dentition was very similar to that of earlier, Middle Miocene felines classified in the genus Styriofelis. However, our recent analysis of the postcranial bones of the small feline from Batallones has revealed unexpected differences with those earlier animals. The middle Miocene Styriofelis turnauensis combined peculiar dental traits (in particular the retention of milk premolars in adult life) with a skeleton adapted for climbing, with short, robust limb bones. Such a skeleton can be considered “primitive” for felids, because the ancestral members of the family were mostly arboreal creatures. The small cat from Batallones shared with Styriofelis the retained milk teeth, but its limb bones now reveal a surprisingly early adaptation for fast, efficient locomotion on land. This condition almost mirrored the one seen in modern animals like the wildcat, but it most likely evolved independently, because the particular dental features preclude Leptofelis from being an ancestor of the modern species. In fact, the skeleton of the Batallones small cat is in itself a mosaic of features, including the presence of a well-developed quadratus plantae muscle inserting on the ankle bone. This muscle has an important function in climbing and it shows that in spite of being a proficient runner, Leptofelis vallesiensis could climb better than most modern cats, both to escape bigger predators and to catch small prey in the high branches. Also the hind limb was especially long and the knee articulation resembled that of modern small carnivores that are excellent jumpers and climbers, such as the genet. It is possible that Leptofelis used its leaping ability to capture small prey such as rodents and birds while foraging on the ground, like modern servals or caracals do. This unique combination of features convinced us of the need to create a new genus for this cat, and we coined the word “Leptofelis”, meaning “swift cat”. In this illustration we show some of the preserved bones of Leptofelis superimposed to a hypothetical reconstruction of its complete skeleton. There are many things we have learned from this study. On one hand, the early diversity of felines is greater than was thought some years ago, when virtually all fossil felines from the late Miocene were classified in the extant genus Felis. On the other hand, we see that the adaptations of feline cats for running not only appeared more precociously than thought, but in fact evolved several times independently. Also important is the fact that the postcranial skeleton, often overlooked in systematic studies, can provide decisive evidence for the proper classification of an extinct animal. And, finally, if we look at the larger picture, it seems that the combination of the small size of the early felines, the need to escape from larger predators, and the presence of vegetational cover in their environments probably provided the right adaptive pressures which led (more than once) to the evolution of the versatile body plan that we see in modern cats. Here is a reconstruction of Leptofelis in the flesh. The coat colour patter is unknown in this animal and here it is reconstructed on the basis of species such as the marbled cat, whose coat markings appear to represent the ancestral patter for all living felines. Isn´t it amazing to think that 35 million years ago, long before the sabertooth cats (or any true cat for that matter) ever evolved, there was such a specialized sabertoothed carnivore as Hoplophoneus mentalis?. This creature was about the size of a large lynx but it specialized in taking prey larger than itself, which it killed by a devastatingly efficient bite to the throat. But rhino-sized animals like Megacerops, shown in the background, had nothing to fear from this cat-like predator. At a first glance (and even at a second and third) the skull of Hoplophoneus mentalis is so similar to that of true sabertooth cats like Megantereon, which lived more than 30 million years later, that you would be excused for taking it for a real cat, even for a direct ancestor of such younger species. In fact, the best heads of paleontology were such deceived for many decades until the detailed study of obscure anatomical features, such as the structure of the ear region of the skull, revealed the true affinities of those cat-like carnivores, which are now classified in an independent family: the Nimravidae. The late Eocene of North America, nimravids included, is one of the most amazing “Lost Worlds” discovered by paleontology. Read more about it in my book “Sabertooth”! For a medium sized sabertooth like Megantereon, remaining unseen was of the essence. With its strong, muscular physique it was not nearly a long-distance runner, so it needed to stalk within a few meters of its prey in order to catch it after a couple of spectacular leaps. But its prey, including medium sized antelopes, pigs or even horses, had a lofty ally: the giraffe. Some 7 million years ago during the Turolian (late Miocene) the giraffid Bohlinia attica had already developed the large size and unique body porportions of modern giraffes. It inhabited the open woodlands of Europe, giving them a striking “African” touch. Any good wildlife tracker in Africa takes advantage of the presence of giraffes in order to locate the big cats. As soon as a predator moves in the vicinity, giraffes stop their browsing or casual walking, and stand motionless pointing with their stare in the direction of the carnivore. That habit is as convenient for the less tall herbivores as it must be annoying for the predators. Back in the Pliocene and Pleistocene of Africa, the giraffid Giraffa jumae was a contemporary of the sabertooth Megantereon whitei. While the cat tried to take advantage of every element of the landscape to conceal itself, it could hardly escape the stare of the giraffe, which surely ruined many an attempted stalk! All cats devote a large chunk of their time to fastidiously taking care of their hygiene and if anything, sabertooths had even more reason to do so. Right after killing a large prey, as it should do at least once a week, a sabertooth of the genus Megantereon would look like a bloody mess -literally. Unlike modern cats, its killing bite relied mostly on causing massive blood loss to ensure a rapid death of its victim, and that implied a somewhat untidy spectacle. But if we could find the sabertooth at any random moment, chances are we would find a pretty clean animal, which is only what you would expect from a cat. If we could time-travel and come across the sabertooth Megantereon, it is very likely that it would be grooming itself! A sabertooth smeared in old blood would be pestered by flies, it would be prone to skin conditions, and would be more easily smelled by potential prey, so it needed to be quite conscientious about its grooming. But of course there are other benefits to grooming, incluiding the fact, obvious to any cat owner, that it feels good and decreases stress! Social species would benefit from mutual grooming but a solitary animal, as Megantereon most likely was, would need to twist a bit around. But then its long and flexible neck would be a welcome aid in reaching those difficult spots! More than 3 million years ago, somewhere in Northeastern Spain, a volcano exploded and created a large crater. With time the crater was occupied by a lake, known by geologists as a maar. Today, the lake is dry and the crater walls have been largely levelled by erosion, but an exceptional fossil site bears witness to the events that took place there. The site, called Camp dels Ninots, is close to the village of Caldas de Malavella in Girona. Maar lakes often create remarkably beautiful scenery, with their encircling walls covered by forests, but some of them hide something more sinister. One example is lake Nyos in Cameroon, which in 1986 emitted a large cloud of carbon dioxide that killed thousands of people and animals. Such toxic gas emmissions occur because the pocket of magma beneath the lake leaks the carbon dioxide into the water, and perturbations such as those caused by a landslide can cause the gas to emerge with disastrous effects. Three million years ago around the Camp dels Ninots maar lake, a rich fauna thrived in a subtropical environment, much warmer than today. Rhinos, tapirs and heavy antelopes crossed the forests and came down the crater walls for a drink at the lake margin. But several of those animals died mysteriously at the shore, and their bodies floated into the lake where they ultimately sank. Their skeletons, completely articulated, got exquisitely preserved as fossils, without any trace of having been disturbed by scavengers. A likely explanation is that the lake belched a cloud of toxic gas, instantly killing all the animals along the shore. As often happens, the animals’ doom was the paleontologists’ blessing, since the death of so many creatures led to their pristine preservation. As the local authorities planned for an on-site exhibit, I was asked to create several reconstructions of the Pliocene environments and fauna of Camp dels Ninots, including a scene showing the hypothetical origin of the fossil accumulation. The scene shows antelopes of the genus Alephis and a rhinoceros of the genus Stephanorhinus on the shore, already showing signs of intoxication, while a tapir (Tapirus) lies on the ground, already dead. The bodies of other antelopes float in the lake while a pair of cormorants that happened to fly too low are already falling. This and other reconstructions of the fauna and environments of Camp dels Ninots can be seen as part of the outdoors exhibit. Thanks to the findings made at the site, we now know a lot more about the anatomy of several species of Pliocene mammals, but, alas, no sabertooth skeleton has been found there as yet. But I don´t give up hope. In central France, another Pliocene maar lake fossil site, a little younger in age than Camp dels Ninots, has been known for about a century, and it has yielded the most complete skeletons known to science of the typical sabertooth cats of the Pliocene: Homotherium and Megantereon. For several decades the French site, known as Senéze, was exploited without any serious excavation methodology, so we don´t know much about the taphonomy of those early finds. But since the 1990s, new field campaigns have yielded more accurate data, suggesting that the fossil mammal skeletons from Senéze accumulated as landslides coming down the crater walls trapped the animals and dragged their bodies to the lake. I took this photo of the mounted skeleton of Megantereon from Senéze, exhibited at the Natural History Museum of Basel (Switzerland), back in 1990. All other findings of Megantereon fossils are more fragmentary, so it is only thanks to the exceptional conditions of the volcanic maar lake that we know nearly every bone of this sabertooth cat. Only a portion of the ancient lake shore at Camp dels Ninots has been excavated this far. Sabertooths like Dinofelis diastemata, whose skeleton is mostly unknown, probably inhabited the area at the time, so it is not impossible that the next excavation will yield an amazingly preserved specimen…who knows? AMPHIMACHAIRODUS COMING YOUR WAY –DON’T PANIC! When you spend time in the African savannah you are surprised to see how relaxed the herbivores can be in the proximity of the big cats. Zebras and antelopes don’t stampede at the mere presence of a lion, but they rather observe it. Information flows in both directions, and the ungulates know how to read the body language of predators. A feline walking casually is no cause of panic, and the potential prey just look at it cautiously until it disappears. And it makes sense, because if zebras had to be in a constant state of panic at the possible presence of a predator, stress would kill them even before the predators would. For us humans as well, irrational fear of predators is probably something that developed once we abandoned our life as hunters-gatherers to become Neolithic farmers. Before that, cautious respect and a keen interest in the predators would be a far more useful attitude than panic. As a sabertooth freak, I often imagine what it would be like to travel back in time and meet my favourite predators from the past. If I were in a B movie, a succesion of screams and chases would follow, and my survival would depend on being the star of the film or a mere sideshow, so I would really stand little chance of survival! But in the natural world, I should rather try to follow the example of the zebra and read the cat’s body language before running. To see an adult Amphimachairodus walking your way would be in impressive sight by any standards. Tall as a lion, it would walk with a cat-like supination of the forepaws, although less exaggerated than in a lion: the structure of its elbow and wrist joints tell us that much. Free-swinging shoulder blades would move up and down as the cat stepped towards us. But the animal’s head would be subtly different from any modern cat’s. The face was narrower, with slightly smaller eyes looking less frontally, somehow intermediate between a lion’s and a wolf’s in terms of relative size and position. The muzzle was long and high but also narrow, with blade-like upper canines showing discretely beyond the upper lips. Amphimachairodus lived a little too long ago for our bipedal hominin ancestors to have come across it, but other sabertooths, such as Homotherium and Megantereon, were familiar elements of their world. I am sure that body-language reading was more important than panic as a reaction to their presence. But timing is everything, and surely there was a right time to panic as well!